Another "A Day On The Green" event and the venue this time is The Hill Winery situated just outside of Geelong. Geelong is in Southeast Australia about 57 miles/84 kilometers from Melbourne. Last edited by sturgess66 on Sat Dec 07, 2013 4:25 pm, edited 1 time in total. 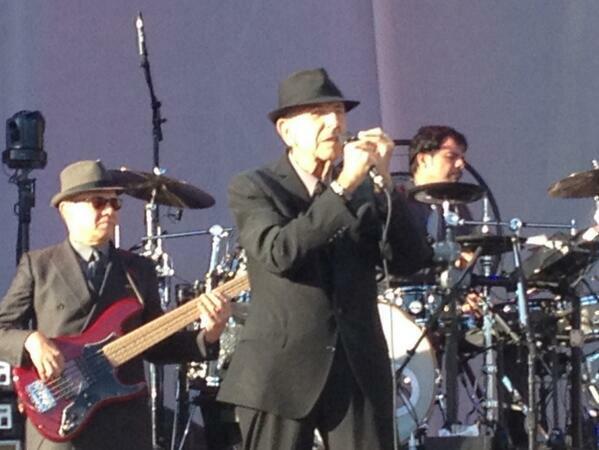 ‏@bek_d - Saw Leonard Cohen perform tonight. Feel somewhat transformed. @VictorNarro- Leonard Cohen at the Hill Winery tonight was sublime, magical, perfect and above all these stupid adjectives. 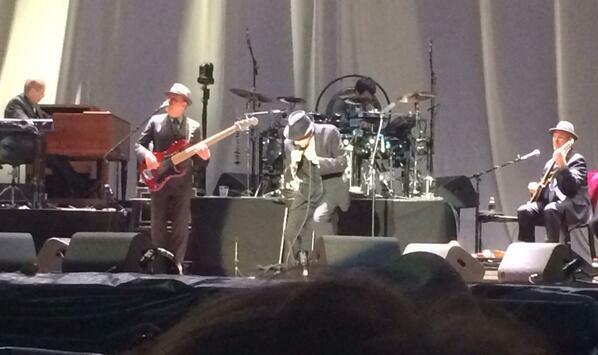 @PabloCalero - Leonard Cohen concert was brilliant, an incredible songwriter and performer! Emilee South - This man. emoji Incredible. I hope I'm still (literally) skipping on & off stage at 79 years old!! What a beautiful day. Last edited by sturgess66 on Mon Dec 09, 2013 6:37 am, edited 3 times in total. I’m back home in Melbourne after my drive from Geelong and as I can’t go to sleep yet, here are just a few lines about my impressions of the concert. It was another memorable one, with twenty eight songs, including I’ve Got a Little Secret! Leonard seemed even more animated than ever and also to enjoy a bit more banter than at the Rod Laver one I witnessed last month, including returning at least one yelled out comment of affection with like! He also paid respectful homage to one of his support singers (Archie Roach) regarding a children’s book that Archie has written and which Leonard not only said he read before the show, but also urged us to get a copy of – a lovely gesture, I thought. Being an outdoor winery concert, it had its usual pluses and minuses: positively, there were the picnic-like fun and conviviality aspects, evident almost anywhere you ventured; but then on the flip side, the distraction of some minor confrontations about view-blocking, loud alcohol fuelled talking or dancing and just that of the revelry or bonhomie in general. This seems to be almost an inevitability at such winery gigs! Furthermore, this winery event was the usual ocean of emotion, with the whole spectrum from beaming radiantly happy faces to quietly crying silently moved faces. I think you get more exposure to this phenomenon at such gigs – apart from the alcohol dis-inhibition factor, I think it’s also because there is more scope for one to notice what is going on with the folk around you. Okay, just my slant on the night – I must go to bed now. Still trying to compose myself, let alone a few words to describe a perfect day. Thanks for that, BM! I was asked a few times by people if they could take photos of it and, as I mentioned, I expect it to also be in the Geelong Advertiser tomorrow (according to their photographer). Also, a big thanks to you and Jim for delivering me to and from the winery, along with B4real. Re the T shirt, Gery, I know you are a member here, so I'll now publicly thank you (and Aad) for the T-shirt in question, which is reaping such enjoyable interactions (with complete Cohenite strangers)! Thank you all for posting the photos, set list and concert report. It was a fantastic day and we were blessed with perfect weather for an amazing performance at a beautiful venue - The Hill Winery Geelong. This is my fourth Leonard Cohen concert since 2010. I thought he was in very good spirits and his energy seemed unending. I also thought he'd shaken up parts of his singing since I saw him in Dublin this September. Outstanding performances by all the musicians and singers as always. Leonard engaged quite a lot with the audience; besides thanking us for coming, he thanked us for gambling on the weather. (The weather that previous week had gone from 36 degrees on Monday to a heavy rain and hail storm with biting winds on Thursday.) He thanked those "in the meadow" meaning those sitting in the grass area on the hill. He also said he's been on tour these past five years and in fact he felt he "was becoming a bit of a nuisance" by returning so often. The audience adored all these quips. Who said he doesn't have a sense of humour? As I’m writing this from Melbourne airport waiting for my flight to Adelaide, it’s suddenly hit me that my last concert is looming up upon me. Over the last few weeks it hasn’t really mattered when a concert has ended because there was always another one to go to, but now it does. I feel us Aussies should do something special for Leonard and the UHTC in Adelaide as this may be our last chance to do so on these shores. We’ll see. 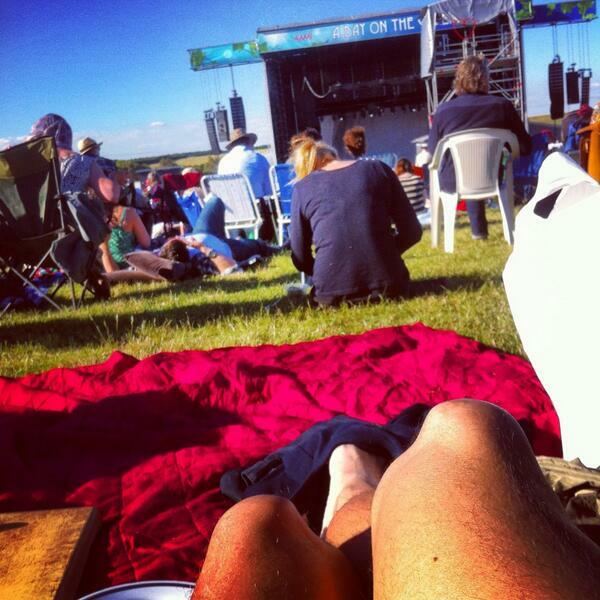 But for now, it’s all about the Hill Winery concert. Before the LC concert started when Archie Roach was on there was a female violin player in his band. I saw Alex in the wings in his ‘civies’ with no hat having a look see and listen to her. I have to say that this concert had some of the best and worst aspects of any concert I have been to so far. The best of course was a great night equal to any I have seen in Oz so far. Everyone on the stage and in the audience was having a great time. I again had a dead centre seat but four rows back with an absolutely unobscured view of the whole stage – probably better than being in the front row – no looking up. The good and bad news was that it was on the isle and from the start the security guard was consistently chasing people away who kept coming down the front and obscuring our view from before the first song. Really distracting. It reached a crescendo during the encores. I wouldn’t have minded but I was getting stood on, bumped and squashed while still in my seat. If I wanted to see I had to stand and still couldn’t see very well. I can understand people’s enthusiasm but a little respect for those who had paid top dollars for their seats wouldn’t have gone astray. In spite of what I've just said it was a truly wonderful night! “Are you putting me on? If you are I like it! I always appreciate a gentle gesture to the elderly. It was simple but I played it perfect! I guess you think that’s all can do…….how ‘bout this.” Then he did his elbow thing again back and forward across the keys. During the second set everybody sang along to I’m Your Man and Hallelujah. Leonard seemed to approve. Antipodean Heat threw lilies onto the stage which added to the flavour of this concert. And for the fifth time in the world, we were treated to I’ve Got A Little Secret. I must add a great big thank you to Blonde Madonna and her husband and to Andrew and Jen for such a warm Victorian welcome and such good company! I had a terrific time! Photos coming when I get to Adelaide. Thank you to everyone who has shared posts and photos, etc! 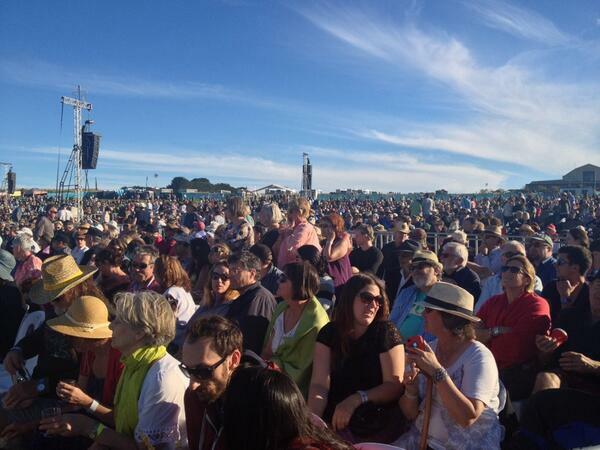 I've been to see Leonard Cohen quite a few times now and yesterday's concert at the Hill Winery was without a doubt the best concert I've ever been to. The crowd was extremely enthusiastic (there was a real buzz in the air right from the start! ), overall the event was very well run and as others have said, the weather couldn't have been more perfect. Leonard Cohen seemed to be thoroughly enjoying himself and appeared to appreciate the extremely warm reception he received. We really loved every second of the concert and it was great to be part of such an exuberant audience. We really felt that last night's show was very special and it was certainly a night I'll always remember. MUSIC filled the grounds at The Hill Winery, adding the perfect atmosphere to a relaxing Day on the Green. There were no traces of the bar lines that plagued last year's event, with more than 8000 guests well fed and watered. Songstress Adalita kicked things off at 4pm while people brought a bottle of wine back to their picnic rug or found their seats. The former Geelong girl sang some of her well-known hits including Ego before heading to the merch tent. "It's just a huge, massive honour and it's unbelievable to be supporting Leonard Cohen on such a beautiful day here in Geelong, where I'm from," she said. Renowned for his storytelling, Archie Roach put on a powerful performance with myriad songs describing his childhood. However there was one name on almost everybody's lips. 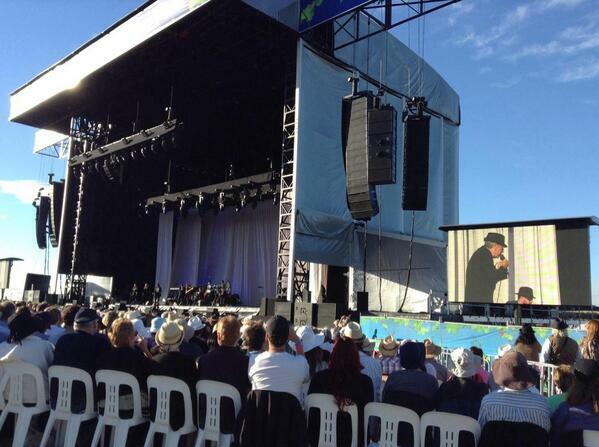 "We're here for Leonard Cohen," said Melbourne's Trisha Richardson. "Also because it's such a beautiful day and of course for the winery." The 60-year-old psychologist was enjoying the array of food and wine with friend and colleague of 18 years, Fiona Strang, 46, who complimented the event's set up. 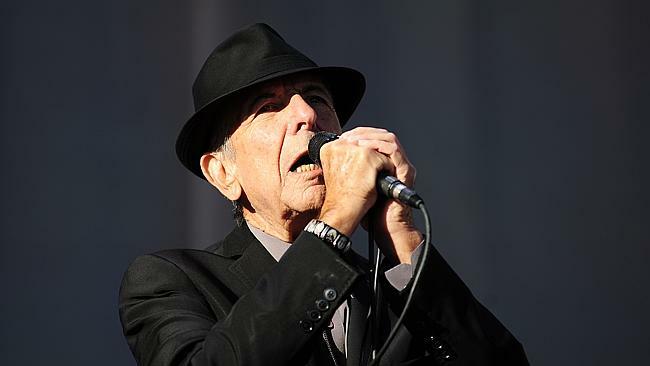 An older, albeit spirited crowd, filled the reserved seating area and greeted Cohen with a standing ovation as his deep, thick voice flooded the venue. Some younger music fans made the most of a cloudless sky atop their patch of grass on the cascading lawn. A delicately devised traffic management plan and strict seating arrangements made the amount of time and money spent on the afternoon's preparation abundantly clear as sound flowed from the impressive stage which took a week to set up. Mark Arkinstall, 55, a retired principal from Ceres, has been to all three Geelong A Day on the Green concerts. "The organisation this year is great, the first time we came people were lining up for about two hours to get a drink it was awful, but this is beautifully organised now, they've got it down pat," he said.